This saw has definitely seen better days, but it is a very early example of the Disston No. 99. This saw is a 7 point cross cut and is presumed to be 22" long. The saw is snapped off near the toe, but placement of the etch makes it possible to make an educated guess as to the length. This saw has also been called the "Prize Medal Saw", owing no doubt to the three medallions used to fasten the handle to the blade. While the date of the first example of this saw has not been established, it has been recorded in catalogs going back to 1876. This particular example dates from 1865 to 1871 because of the fact that it is marked "Henry Disston and Son". The No. 99 continued into the 20th Century, vanishing sometime between 1914 and 1918. At right is a close up of the apple handle. While worn, note the sets of "hound's teeth" on the top and bottom of the handle near the start of the horns. 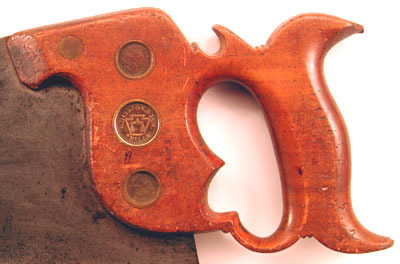 This is an embellishment common on British saws and very early American saws like this one. Also note the characteristic "notch" in the lower left portion of the handle. Only the No 9, No. 99, No. 12 and No. 112 had this feature. At far right is a close up of the medallions used on this saw. All hardware is of the split nut variety. Note the early style eagles on the top and bottom medallion. A shot of the etch. Note that the "99" is stamped in the blade, rather than etched as in later examples. Since the stamp was applied after the blade was hardened, the mark is very light.